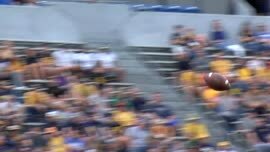 West Virginia running back Alec Sinkfield (20), who hasn't played since getting carted off against Youngstown State, will be ready to run again when the Mountaineers host Baylor. MORGANTOWN. W.Va. — What started out as a memorable night turned sour for West Virginia running back Alec Sinkfield. After making his first start and scoring his first career touchdown on a 9-yard scamper in the first quarter against Youngstown State, the redshirt freshman went down with a leg injury in the second quarter. Grabbing his knee in pain, Sinkfield needed help walking off the field. Once to the sideline, teammates gave him a pat on the shoulder pad as he sat in the back of a cart, eventually wheeled to the locker room with a towel over his head. He didn’t return to the game. 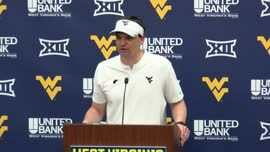 Coach Dana Holgorsen soothed concerns after the Mountaineers’ 52-17 win over the Penguins, believing Sinkfield “should be fine,” though a diagnosis hasn’t been confirmed. Offensive coordinator Jake Spavital said Sinkfield earned the start over the other three because he had a good week of practice and thought Sinkfield fit schematically for what he wanted to do with the game plan. True freshman Leddie Brown showed what a force he can be not only between the tackles at 5-foot-11 and 211 pounds, but outside the hashes. He led the team with 115 yards and scored his first career touchdown in the third quarter. 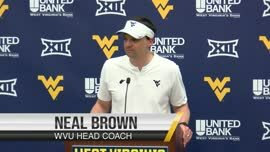 Gashing, slashing and breaking tackles, Brown gave WVU a big sigh of relief when he took over for Sinkfield. 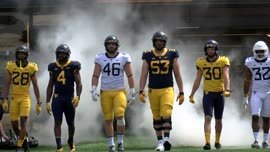 The total carries were close to being split between Brown (15), Martell Pettaway (12) and Kennedy McKoy (11), and Holgorsen made sure to profess again that no one is considered a starter. It will be by committee for the foreseeable future. Pettaway finished with 77 yards while McKoy added 76 and a touchdown. The four backs combined for 43 carries at an average of 6.3 yards a pop. 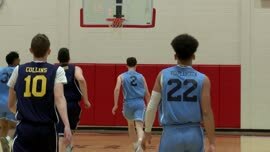 Youngstown State coach Bo Pelini is known for his stout defenses, so Spavital knew he had to run the ball because the Penguins like to play with defenders outside of the box.